Jesus entering Jerusalem in the Passion Play at Oberammergau. The villagers of Oberammergau in the German Alps have faithfully kept a vow that their ancestors made to God 386 years ago. The townsfolk promised — in 1633 — that if Oberammergau was spared more deaths from the bubonic plague ravaging most of Europe, they would put on a play depicting the suffering, death and Resurrection of Jesus. Further, they pledged to present the play every 10 years. No one else in the town died from the plague, and residents who had been suffering from its effects miraculously recovered. In 1634, Oberammergau residents put on their first Passion Play. It has been performed there ever since in years ending in zero. The exceptions were performances in 1934, which was the 300th anniversary, and in 1984, which was the 350th anniversary. The 1940 performance was canceled due to the onset of World War II. Msgr. Gerald Orbanek, a retired priest of the Diocese of Erie, attended the Passion Play in 1984 and 1990. He will not attend the 2020 Passion Play, but two separate groups from the Diocese of Erie are planning to go to the world-renowned event. They will join thousands of people at the performances, which are typically held from May to October. Father Brian Vossler and Deacon Bob Ball, pastor and deacon, respectively, of St. George Parish, Erie, and Deacon Denis Coan of St. John the Baptist Parish, Erie, will host, with the deacons’ wives, a pilgrimage next July to Poland, Prague and Germany, with a full day set aside for the Passion Play. Father Monty Sayers, pastor of Immaculate Conception Parish, Clarion, is hosting a trip next September to Germany, Prague and Austria, also with admission to the play. It will be the first time that any of them have visited Oberammergau. “I think given the whole world situation at this time, this event will give testimony to the Gospel,” Father Sayers says. For Deacon Coan, it’s another pilgrimage that he and his wife, Mary, are looking forward to taking together. Last year, they traveled to Israel and saw the sites where Jesus performed various miracles. For them, Oberammergau will be a chance to more intimately experience the suffering and Passion of Christ. “We’ve heard about the Passion Play on and off, but it wasn’t really on our radar. It became more so after I was ordained in 2008,” Deacon Coan says. According to Msgr. Orbanek, the Passion Play begins in mid-morning on an open-air stage in a covered auditorium that seats about 4,700 people. The play continues until lunch. After a two-hour intermission, it resumes and continues until evening. Marge Ferrick, 77, a parishioner of St. George in Erie, hopes to return to Oberammergau in 2020. It will be her third trip. Only natives of Oberammergau or those who have lived in the village for more than 20 years may participate as actors, singers, instrumentalists and technicians in the Passion Play. According to the official Passion Play site (https://www.passionsspiele-oberammergau.de/en/home), next year’s show will feature participants ranging in age from infants to 96-year-old Anni Drohmann, who will be the oldest performer on stage. 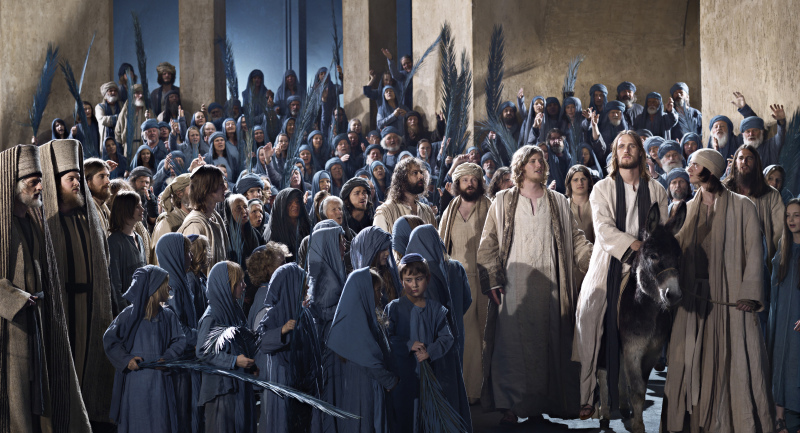 Roughly half the inhabitants of Oberammergau, about 2,000, took part in the 2010 Passion Play. About the same number is expected to perform in 2020, with an estimated 500 children serving as extras. Germany, Prague and Austria, with admission to the 2020 Passion Play (NAWAS International Travel, Inc.), Sept. 15-26, 2020 Contact: Father Monty Sayers, Immaculate Conception Parish, Clarion, at 814-226-8433, ext. 102 (church), or email montysayers@hotmail.com. Download a brochure at www.icclarion.org.